Thank heavens for this blog. If not for this blog, I wouldn’t have been compelled to dig out the Moderne Baby Blanket from the work-in-progress basket (where it had been marinating, untouched, for no fewer than two weeks), so I could take a picture to share with you. Because once I unearthed it, I was shamed by how close I was to finishing. How close? About 1.5 rows of knitting, then the final bind-off, and the border. Most of the ends had already been woven in. For real. Pattern: Moderne Baby Blanket from Mason-Dixon Knitting . I made small changes to the pattern as I went along, based on the amount of yarn I had available. But the overall construction is true to the original. The only notable change is that instead of knitting the border, I crocheted two rounds of SC: the idea of picking up hundreds of stitches only to bind them all off three rows later terrified me. Needles: US 6 circs, INOX express and KnitPicks nickel-plated Options. I’m not sure how much of each color I used. My scale weighs in the finished blanket at 1 pound and 10.5 ounces (750 grams), which comes out to 15 balls of yarn total. The finished size of the blanket is about 38.5″ x 30″, just a little bit larger than specified in the pattern. The blanket is hefty, but it didn’t become the sort of suffocating monster I once envisioned. It’s actually quite soft, fluffy, and cushy! Despite Gedifra and Sundance label instructions (both yarns indicate machine-wash cold, dry flat), I tossed the blanket into the washer and dryer. I think the dryer helped with fluffiness :). Someone asked if I tested each of the yarns for colorfastness before knitting them all together. I hadn’t. I didn’t anticipate any big surprises because dye did not come off on my hands while I was knitting. In the end, Classic Elite Sundance did bleed a little bit onto neighboring light-colored sections. But not enough to make me worry about ruining future washes. What I like the most about the finished blanket are the tidy lines between the different blocks. I found myself paying a lot of attention to that as I was picking up stitches, making sure that the connections would be as straight as possible. Since half a stitch or an entire stitch is lost during the process, I often picked up one more stitch than the pattern specified. I also like that the back side of the blanket looks almost as neat as the front! I enjoyed knitting this blanket, but I’m not sure I would knit it again. Each section is connected to the one worked before, so very quickly the project becomes a giant undertaking: not easily maneuverable, and not at all portable. Garter stitch compresses greatly in the vertical direction, making noticeable progress that much slower. I think knitting something like the mitered square blanket is easier for me, since it’s worked in manageable parts (but not so many that the seaming would make me go bonkers). How about you? Superb, just superb. I love the colours you chose, it looks very cool, very chic, very moderne! It looks great! I love the crispness of the colors you chose. I like the finishing in increments of a mitered square or babette, but it does allow for breaks in the momentum…those dangerous breaks! I started a mitered squares blanket in sock yarn. The stitches are kept live for making an applied i-cord edge. I think that is the only reason I didn’t run terrified. That would be a heap of stitches to pick up. Love. It. Looks like an Arts&Crafts-style window. Nice choice on the crocheted edging; I think it will help to reel in all that garter. Great color choice. Very bold! I might be inspired to start another blanket. I love it, colour, geometry. Mmm! Thanks for the photos. How ’bout me? Well, I’ve been working on a full sized version of this blanket for about two years. If by working you mean staring at it sitting in a heap in the corner dreading the final touches? I am so very close to finishing — need to weave in ends and sew up the corners of the border. That is all. And yet I can’t muster the strength this week to make it to the finish line. Maybe next week. This blanket is gorgeous. The greens really work well together. I myself am knitting a log cabin blanket but I’m not following any pattern. I just make it up as I go along. I might steal your idea for the crocheted border though. I love your colourways, wonderfully bold and crisp. Your version is the nicest I have seen, and quite enabling. Love it. It’s gorgeous, and very well made. Your focus on all the finishing details is a real inspiration! I’ve made mindless blankets in one piece, and I’ve made them in pieces. I vastly prefer single piece blankets. I loathe seaming, and I really enjoy the weight of the ever-growing project on my lap. It’s hard to see progress when one is forever starting a new small segment. Love it! You were one smart cookie to crochet that edging. I think I’ve made seven of these now…they have all been well received and USED! It’s fantastic! Great color choices and beautiful knitting. I’ve knit this blanket, too and agree that it’s a bit unmanageable. And it seemed to take forever!! My recipient didn’t get his til after he was born, even though I started well before he was due. It Pickled a while in my WIP box. Love the colors you used. That’s going to be one lucky, warm babe. Beautiful job. Such a nice combination of colors. I began a log cabin blanket a couple years ago and quickly became overwhelmed and bored. It now lives in a laundry basket behind my couch and looms like a mean dog under a chair. lol! I pull it out when I’m sick or otherwise laid up and need something mindless. It will be a long haul. That is really, really, REALLY gorgeous even if it did threaten your composure. I love the color’s you’ve chosen. I’ve been wanting to attempt a log cabin but all the garter stitch is daunting. Well, I haven’t really knit a blanket yet… but I have ordered the yarn for a baby moderne, so let me get back to you on that. Love that green. It’s funny. I normally don’t gravitate to that color but lately I’ve been all over it. So beautiful! But I’m with you – all that garder st would make me go crazy. It would have been sitting in my to-finish pile for much longer than yours did! Good call on crocheting the border instead of picking up and knitting all those stitches. Even though its a behemoth, I bet I will try this pattern one of these days! Wow Kathy, so simple yet so nice…… so even etc…. awesome! I love the idea of the mitred squares, but I think I would do a combination of squares that are picked up and seaming, because I dislike the sewing part of knitting. Something that would optimize portability without making it too onerous in the finishing. This blanket is gorgeous! I love the colors and the pattern. It really is super modern! Beautiful blanket, Kathy. I have made four of these blankets, large enough to cover the top of a queen size bed for adult children and grandchild. 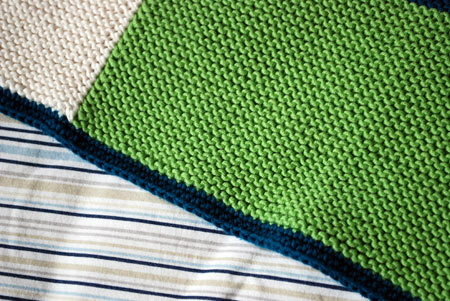 I mainly made these in their favorite NFL team colors – while not portable, they are nice blankets, and they enjoy them. Since I was not sure they would be cared for properly, I knit them out of Lionbrand Wool Ease. What a gorgeous blanket!! You have done a magnificent job on it! Love the tidy back, also. You are inspirational. I love the color combination and I really like the crocheted edge. I did an applied i-cord, which was fine, but your method seems simpler. I’m with you – glad I made it once, but probably won’t do another one. I love your colors! Gorgeous. 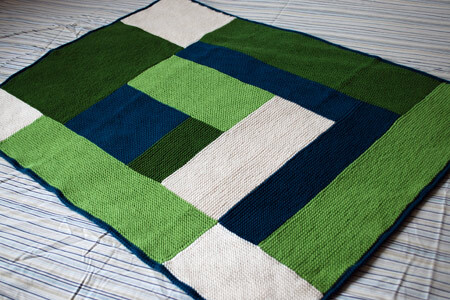 I have made this blanket and a mitered squares one and do prefer the mitered squares. In fact, I’m about to start another mitered squares. I don’t think I’ll do another Moderne either. It tested my capacity for garter stitch and I hit the wall with it. But I loved the blanket and so did my granddaughter. It is now full of holes that I would love to know how to fix (don’t know how to darn). Miters are like popcorn. Just can’t stop making them. And I found seaming them to be fun, too — which was a big surprise as I’d been dreading it. I’m looking forward to seeing what you do w/ miters. Oh my god Kathy – this is just plain gorgeous. I’m speechless. I actually have one of these “marinating”. It’s been waiting for me for…oh, I’d say about 2 years now. It was meant for my son for nap time at daycare–he starts school next year!! HA! I used Pakucho Organic Cotton–not easy on the hands. I would consider making it using a superwash wool only. I LOVE your blanket though–the colors are great. Nice job! Great blanket. The colors are fabulous, and I love the very clean look. Like you I tend to prefer more portable blanket projects! It’s gorgeous! I like how your wips sit around for 2 weeks, mine linger for 2 years! This is gorgeous. I seriously love it. Great color choices. I agree with Nova…2 weeks isn’t a very long marinating time in my book. Love it. I had been checking in to see your progress. I had thought about doing a MBB as my Knitting Olympics project, for a friend expecting her first baby in March. However, I was inspired by your color choices to buy yarn for a future project that I’m swatching for now. And ignoring the Log Cabin (also from M-D K) project that’s one skein away from completion. I can see why this blanket would have been a bit of a pain, but it turned out so beautiful! I love the colors you chose. Good for you for digging it out and finishing it!! for those who don’t like miles of garter stitch, I have one answer: T.V. Get a bunch of DVDs and get cranking. I’ve finished many a project in the company of Joss Whedon. Wow, it is so beautiful, green is my favorite color. When can I have such a blanket for my baby? 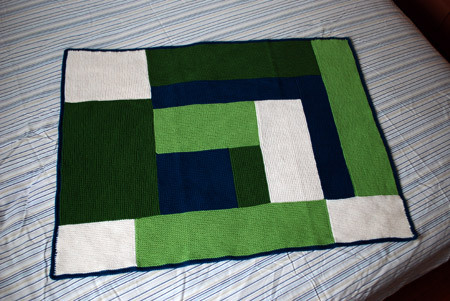 Blue & green are such winning combination, love this blanket so much K! Your blanket is gorgeous! I’ve been wanting to make one of those for some time and I think your post is pushing me closer and broadening my ideas of what colors to use which has been the biggest stumbling block on getting this going (no pun intended). Also, I know get why crochet edges are so popular! Thank you. What a DUH! moment for me. I haven’t crocheted since the dark ages of the 1970s, so I totally forgot about the no bind-off aspect. I learn more from your blog than any other single source. Thank you, once again! Gorgeous. I’m in the middle of one of these now (ok, not in the middle. starting. but my center square is huge, which I thought would help get and keep me going. I know not from where this logic comes) Anyway, your joins/edges/whatever are amazing and super straight, which I have noticed to be a problem lots of people have. Good to know it can be done, but scary too. You knit the most beautiful and interesting things. It is certainly a thing of beauty! Love the green. This is beautiful! The colors you used are so crisp and fresh. Love it! The colors are lovely – almost enough to make we want to make it! I have knit this blanket and you’re right – it’s a lot of work with the garter stitch (although brainless knitting can be nice), and it quickly becomes to big/heavy to be a portable project. But I did enjoy making it! Congrats on a lovely FO. That is sooo pretty, I love the colors and pattern! I love the colors! I made one in shades of brown and beige that my 15 year old grandson appropriated saying, “this will be perfect to take to college.” He always did plan ahead. I have been thinking of making another and since I don’t live near you, may I use your colors??? This is a great blanket. I’m so glad you mentioned what yarn you used. It looks especially crisp and bright. Good job! You’re inspiring me to knit baby things, and I don’t even have a baby in the family or friends arena to knit for! Guess I’ll have to gear up for some charity knitting. Oh, it’s just beautiful! Love the colors you’ve chosen – so crisp and bright. Very nice! Beautiful mellow colors. I’ve made two of these one knit and one crochet. I hear ya on picking up those stitches at the end. 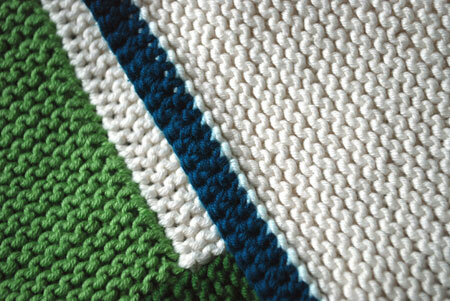 I ended up crocheting the border on my knitted Moderne as well. I made one of these last year – positive experience on the whole, but although baby blankets are the most requested handmade item I make they are almost always the most tedious to make. Knit, crochet, it matters not. This one was actually more enjoyable than most – all that garter is great for movie viewing. Love the crochet edge and will def. steal it for my next run at this one. How DO you pick up your stitches? They look fantastic! I love the blanket! The colors are great together. Wow! Kudos to you for finishing. It’s lovely! I have blog-stalked you, Grumperina, for many years now and I am finally going to post a comment. While I know that this blanket is a simple knit with it being garter stitch throughout, your’s is lovely and surely took some stamina. Congrats on this beauty! What a gorgeous blanket. The colors are just beautiful and the straight lines…ooh… Love it!